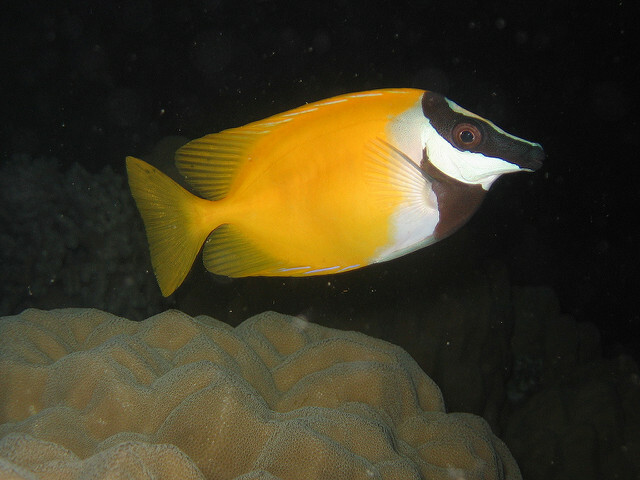 This might be unfair, but, from what I’ve gathered, there are very few aquarists who get excited by the Foxface Rabbitfish. Despite its bright, cheery colors and interesting pattern, it seems the main reason these get purchased is to control nuisance algae (though, rather ironically, they are really only good for controlling bubble algae… but, I digress). Who out there has grabbed a foxface out of pure, unadulterated love for Siganus vulpinus? Who out there is keeping this fish in a mated pair, as they are normally found in the wild? Pity the poor, lonely foxface swimming about in solitude. 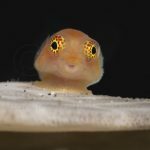 Today, I’d like to show a little appreciation for this humble fish and discuss its intriguing evolutionary history. You’ll often see the Foxface, along with the rest of its kin, classified separately into the subgenus Lo, based on the elongation of the face found in this species group. But genetic study has resoundedly disputed this, showing quite conclusively that this lineage is actually derived from well within the genus Siganus. 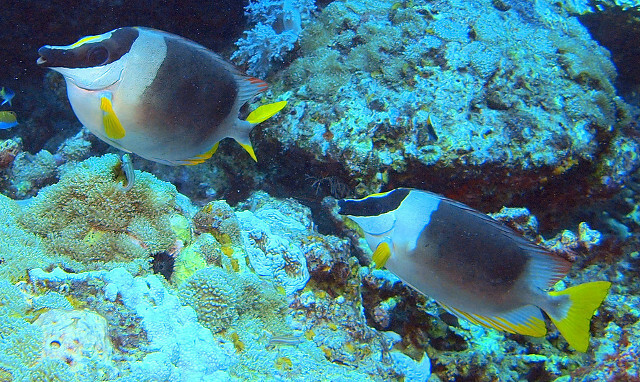 Their unusually attenuated shnoz is even found, albeit to a lesser extent, in another common aquarium species, the Coral Rabbitfish (S. corallinus), having independently evolved for the same algae-plucking task. But what I find most fascinating about this group is their rather idiosyncratic distribution. 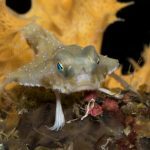 There are five recognized species at the moment, with a range stretching from the Andaman Sea to Okinawa, Micronesia and just barely into Polynesia. 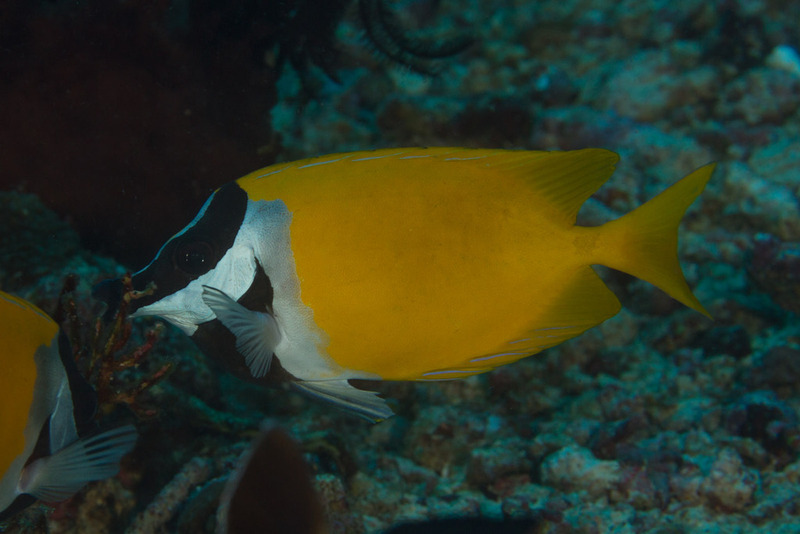 One of the rarer and pricier of these fishes is the Magnificent Foxface (S. magnificus), which is apparently known only from a few reef systems in the Andaman Sea. 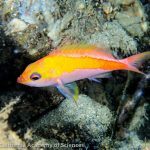 It might be expected to occur elsewhere in the Eastern Indian Ocean, especially along Sumatra’s coastline, but, strangely, this very distinctive fish has seemingly yet to be found anywhere outside of its tiny known homeland. 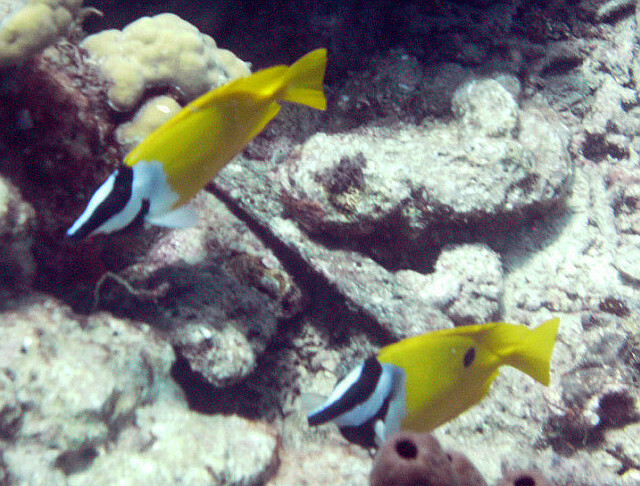 The nearly identical Onespot Rabbitfish (S. unimaculatus) has a curious distribution, found as far north as Okinawa (though, strangely, not any further in the Ryukyu Arc) and south through most of the Philippines. Other records exist from the Spratly Islands in the South China Sea, from off northeast Borneo and some uncertain reports from peninsular Malaysia, where it is replaced by its immaculate relative. Genetic studies have thus far shown little difference between these two, suggesting that their split was quite recent and incomplete, allowing for extensive hybridization. Their biogeography conforms quite well with a faunal break in the region known as Wallace’s Line, first illustrated by the famed naturalist Alfred Russel Wallace. 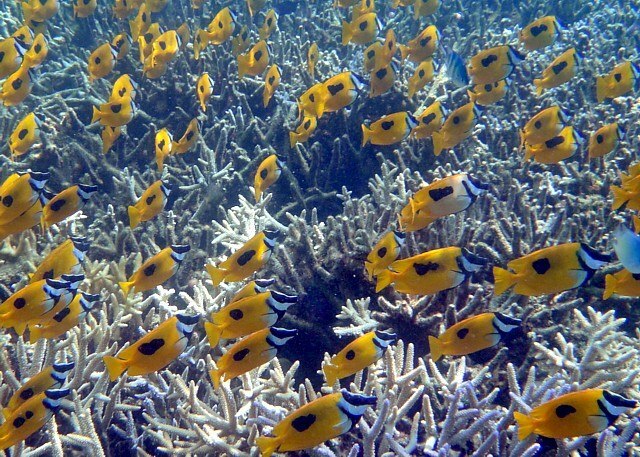 The root cause of this likely stems from periods of glaciation that lower sea levels, effectively cutting off the Philippines from reefs further south and allowing speciation to progress in isolation. But the strange thing about S. vulpinus is how phenotypically consistent it appears everywhere else in its range. In many other groups of reef fishes, especially those with a tendency to form regionally endemic taxa, we expect to find a strong split between Indonesian and Melanesian populations, such as that seen in Chaetodontoplus mesoleucus and C. poliourus. But not here. The foxfaces of Micronesia are all but identical to those in the Java Sea and the Coral Sea. It’s hard to reconcile this incongruity, and we might expect to someday find evidence in their genomes for several cryptic “species”. The absence of this group in Japan is also particularly striking, given how widespread it is elsewhere, as is the vacancy in the Mariana Arc… but, why? Things get even more complicated when we venture into the South Pacific. 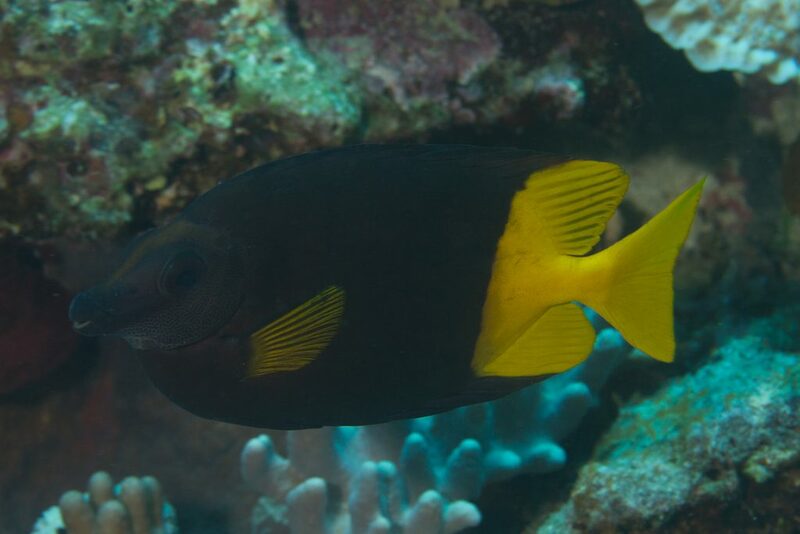 At Fiji, which marks the easternmost edge of Melanesia, famous for its high rate of endemism, we find the unmistakable Bicolor Rabbitfish (S. uspi). 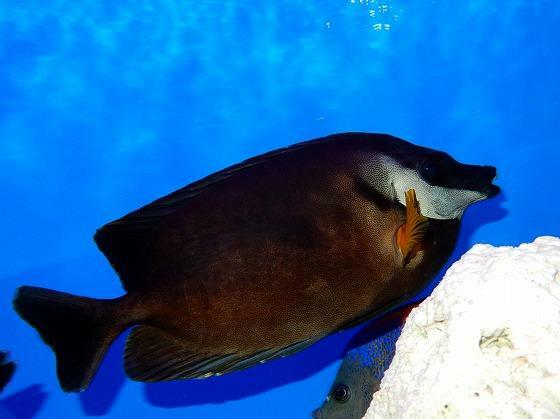 The melanism of this fish is taken a step further by the Black Foxface, a dismal, wretch of a species known only from Tonga and Tuvalu and rarely seen in aquarium exports. Both of these island groups, along with poorly studied areas like Samoa and Wallis & Futuna, are considered to be part of a broader Polynesian region that stretches east to Hawaii, the Marquesas and Easter Island. 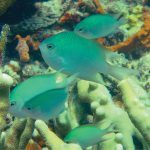 We see this same pattern of speciation in other reef fishes in this area, such as with the Meiacanthus fangblennies—a study of stony coral biogeography has likewise highlighted the unique qualities of this region’s fauna. But we still don’t have a good understanding for the fundamental causes that ultimately drives this speciation to occur. The islands of Fiji and Tonga are both quite old by Central Pacific Ocean standards, but the distance separating the two is fairly insignificant… so what conditions have fostered the emergence of these two distinctive foxfaces? Tonga, why is your foxface black? As tends to be the case, I don’t actually have any answers to the questions I’ve posed here. But it’s still important to ask them. 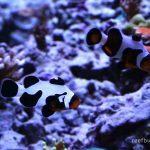 Why are these five species of foxface found where they are, curiously scattered across the Indo-Pacific in such a whimsical manner… how did they get there… where are they going?